Last night, the Lady Longhorns C team was victorious over the visiting Rams by a score of 49-5. Quite the blow-out. John and I were able to get to the game on time and sit with the other parents. The C team is the freshman team, so not the same group of parents we got to know last year, when Alex was JV. We always sit near the parents, whether or not we know them. John, because he is very social and me to educate. My MO is usually something along the lines of “Hi, I’m Alex’s Mom, your daughter is so nice to Alex”. Thankfully, this is almost always true, but my goal is to get the other parents to support Alex on the court. I was successful last night. I find freshmen girls are evolving into full blown teenagers, with its own set of challenges including maturity. This was my concern for Alex, playing on the freshman team. I want her to be with girls who are confident in their athletic skills and understand teamwork. The coach disagreed with me on this – explaining that this year’s freshman team was more mature and inclusive than the teams in the past. I took the “wait and see” attitude. Last night I saw, and was pleasantly surprised. There were two coaches last night; the JV coach I have been working with, and the C team coach. These women work well together and understand the team work I preach. Alex, as well as the entire team, played their fair share of the game. Alex huffed, puffed and hustled through part of each quarter. Exercise is good! There seemed to be two or three ringers on the team, and they had more bench time that I expect is normal. This was a good sign to me - a lopsided match like this is a learning opportunity for the team. The coaches very aggressively worked on the “Alex play”. 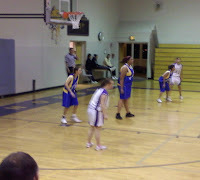 Alex was urged to stand under the basket, the girls pass to her, block the defenders, and Alex shoot. This was a successful play, but no points for Alex last night. She hit the rim at least six times, but the ball never made it through the net. The other parents, the coaches and the girls on the bench cheered each time Alex had the ball. We even heard “pass it to Alex” from the parents sitting behind us. Mission accomplished - I was happy and proud for Alex. There is something about her smile of accomplishment that melts my heart. But, I noticed, there were definitely times when the team, including Alex, did not listen to the Coach, and Alex did not get free. There were times when Alex was free, but pushed out of the way by a charging team mate. There were times when a pass meant for Alex was intercepted by a team mate in a quest to make another basket. This is really not that big of a deal, I know the season is young and so are some of the girls. As John and I left the gym, I passed the coaches. I believe they are trying to make this a successful basketball season for Alex – and I thanked them. We started off on a bad foot, and I am going to make amends. The coaches were pleased Alex came so close to scoring, and are confident she will score soon. I know these talented and dedicated coaches believe. One of their challenge as coaches is to inspire all these freshman girls to believe. I believe they will!